It Came From the Basement | Barbie Who? This is the second installment in a series I lovingly call ‘stuff we found at grandma’s house’. These items were a total surprise to me. It all started when we noticed a rotten smell coming into the bathroom. At first, we thought one of the cats had hidden a dead animal somewhere in the area. After an extensive search and thorough cleaning, we didn’t find anything. When the smell became worse, we realized it was coming from the basement. Nobody likes going down to the basement. My parent’s house is 120 years old, and the basement is unfinished. It has brick walls and a cement floor. There are always spiders and numerous spider webs on the stairs leading down to it. Occasionally, you will see a mouse or snake hanging out in there. It is pretty gross. Despite all of that, bad smells will make you do extreme things. We bucked up and went down to investigate. When we went into the basement, the source of the bad smell was obvious. There was an inch of stagnant water sitting on the basement floor. It was overwhelming at first, but things improved when we used the wet-dry vac to remove the water. Because of mold and bad smell, we also had to empty everything out of the basement that we could move. Thankfully, there isn’t much down there: only emergency supplies, a hot water heater, and a few storage boxes. We moved everything onto the front porch to air out. While we were moving things around, we found this green tub filled with toys. Long story short, the standing water in the basement didn’t come from rain. It was from a leak in the water heater. We replaced the heater, and that solved the bad smell problem. It took a lot of cleaning and a week of airing out the basement, but the moldy smell went away. The only thing left was to sort through boxes to see what had been ruined. 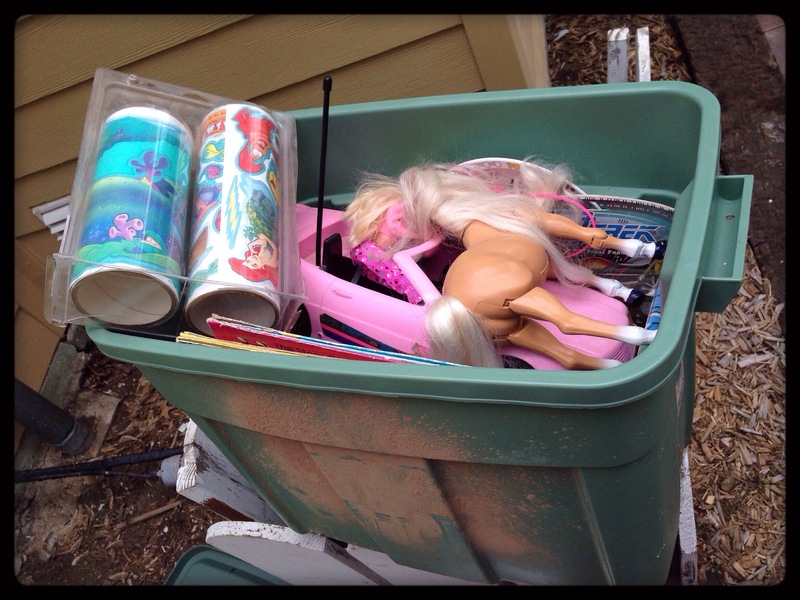 Most of the items were salvageable, and we found some gems in the green tub filled with toys. I was delighted to see the contents of this box. Unlike the other things we found around the house, I had no idea that my mom held onto these things. I thought these toys had been given to charity when I was a teenager, but it turns out they were tucked away in the basement for over a decade. I was delighted to take inventory, and these are the Barbie toys in the mix. Growing up, I had two Barbie cars. One was a stretch limo and the other was this glorious beast. I remember that I received the limo for my birthday when I was 6 or 7. I was so upset because my younger cousin, Derek, sat on it and tried to ride it. I thought he was going to break it! Luckily, nothing bigger than a cat has tried to get into this car. In fact, I have fond memories of when my sister and I would harass our cat, Ariel, with it. She was a good cat who grew up with 2 rambunctious girls and all our crazy antics. It was a wonder that she ever let us pet her. The car itself has held up well; it even still has the remote. It is somewhat faded, but the wheels move without any problems. It also cleaned up well and no longer smells like flooded basement. The car is battery powered, and I haven’t been able to get it working. My husband said he would crack it open and see if there was anything he could do to fix it. I found an eBay listing stating this is a 1993 pink Barbie convertible RC car. I wasn’t able to find anything else about this model elsewhere online. If I find anything more concrete, I will update this post. 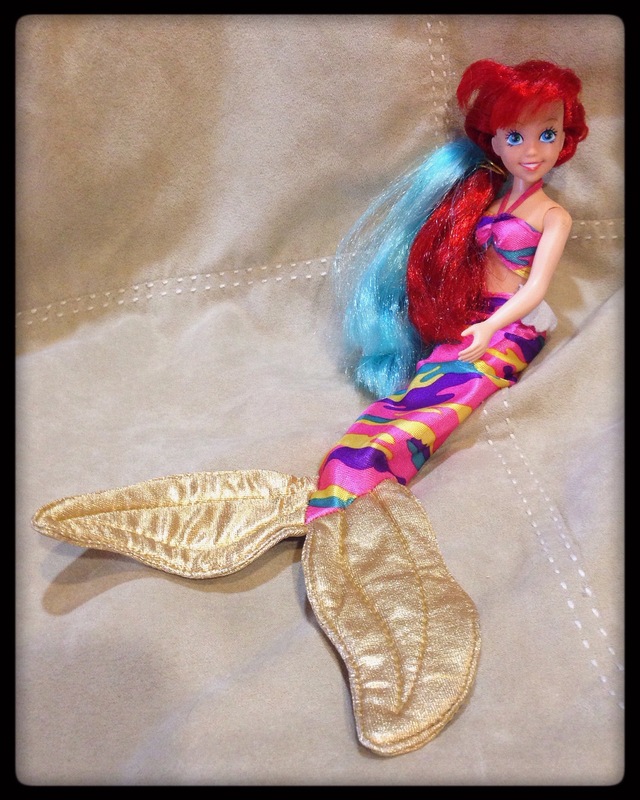 Up next is an adorable Ariel doll. The Little Mermaid was my favorite movie growing up, and I had several dolls from the movies. This doll is a Hair Fashion Ariel doll made by Tyco in the early 90’s. She is shorter than the Ariel dolls made by Mattel, and her face looks younger. I wasn’t able to find any web pages or blog posts about this doll, but I did find this photo by PrincessMermaid. It shows a picture of the doll in her original box. Isn’t she pretty? My Ariel doll is a bit worse for ware. She is missing a few accessories, and when I took its clothes off for cleaning I realized that her leg was broken at the joint. I am fairly sure that this break happened before I found the doll because I hadn’t tried bending any of her joints. However, I can’t rule out that some of the other people in the house handled her before I was able to start cleaning. I don’t know if it is going to be something I can fix because of where the break is located. 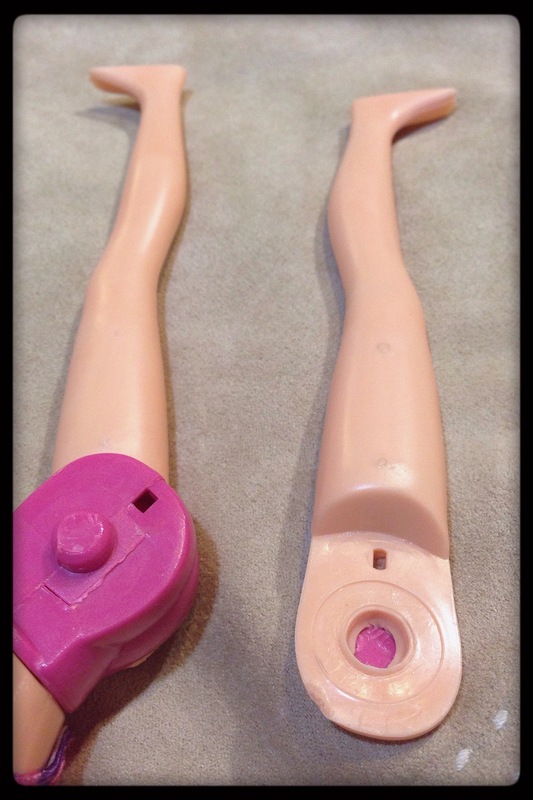 I am sure that I can glue it back into the joint, but I am fairly sure the glue would fill the entire socket and the doll would lose the ability to pivot in that area. With her tail on, it isn’t a big problem. The leg stays up and can bend into different positions, so I am keeping it as-is for now. This vintage Ariel doll is just hanging out with the other Disney princess dolls for now. The other doll in the box is a veterinarian Barbie. Growing up, I loved animals and I insisted on having the veterinarian Barbie doll. She was released in 1996 and is called Pet Doctor Barbie. If memory serves, I received her as a birthday gift from my mother. I remember that she came with a cat, a dog, and a basket that made noise. While we seem to have lost a few pieces from the original set, her outfit is surprisingly intact. She has the matching shirt and pants. I don’t entirely understand why a veterinarian would wear a cropped off shirt, but then again it was the 90’s and Mattel did some pretty crazy stuff with some of their dolls. 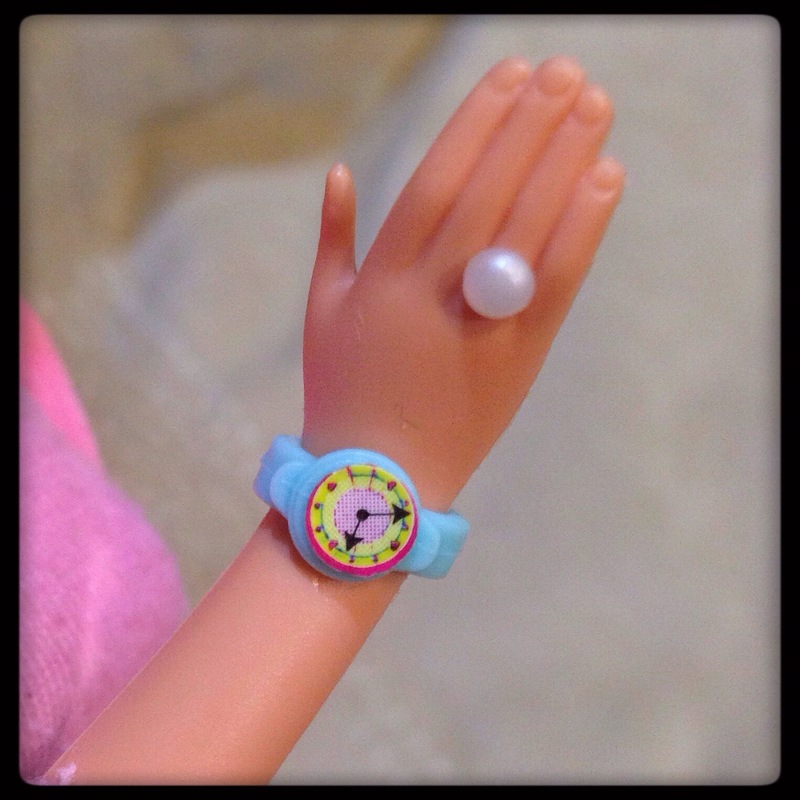 This Barbie even has her watch! Can you believe that such a small piece stuck around for so long? It would have been cool if she had her stethoscope, but I wasn’t that lucky. I am excited to have her to pass on to my daughter. I hope that she loves animals as much as I do and enjoys this doll as much as I did. This Barbie doll and the Ariel doll didn’t lose the basement smell from airing out alone. These two dolls smelled terrible for longer than anything else we found. They smelled the worst out of everything in the box when we first found them, but I managed to solve that problem. First, I cleaned them and their outfits with dish soap and let them air dry. While I was cleaning Barbie, her pink plastic hair band disintegrated. The plastic was old and I think it had hardened with age. I picked out all the bits of pink plastic from her hair and, once the hair was dry, I replaced it with a brown plastic band. Cleaning with soap wasn’t quite enough to remove the smell, so I soaked both dolls in a mixture of 1 part vinegar to 3 parts water overnight. Then I let them air dry on the front porch. I repeated the soaking three times before the smell was completely gone. I like using vinegar. The slight acidity of the solution killed any microbes that were living on the dolls. The vinegar solution didn’t discolor the skin or hair of either doll or their clothes. It took some effort, but I am happy that I was able to salvage both dolls. This next find is something special. It is my walking Barbie horse. I received this horse for either my birthday or Christmas in the 90’s. I remember how delighted I was by her and her ability to walk. I also remember how much our cat disliked her and would attack her when she was walking on the kitchen floor. Luckily, she was cured of basement smell with just a scrub down and airing out on the front porch for two weeks. Her hair was a bit worse for ware, but I’ve seen worse. To fix her hair, I combed it out and gave it a hot-water dip. That managed to tame it enough for me to braid it with my friend, Gwen. I did the tail and she did the mane. 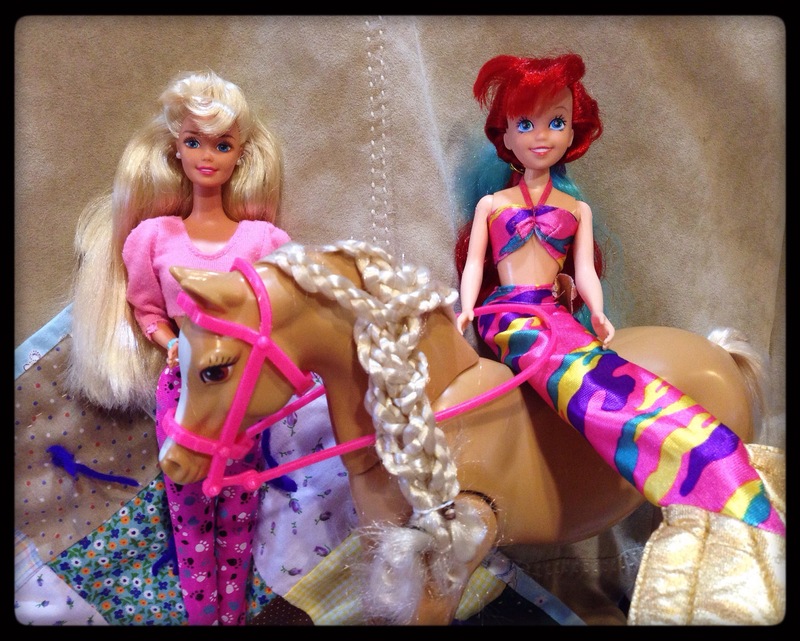 We were like little girls again, sitting on the living room floor braiding a doll horse’s hair. It was fantastic. This horse can walk! Luckily, her internal electronics are still intact and running. This makes me extremely happy, and it brings great joy to all of us to see my toddler running after it. As far as identification, I wasn’t able to find an exact match for this horse online. I believe it was just called ‘stepping horse’ or ‘walking horse’ because I don’t remember the name Tawney at all. I can see that the horses released over the last decade or so all seem to be named Tawney. I was able to find several horse gifts sets that were released in the 90’s, but none of them rang a bell to me. 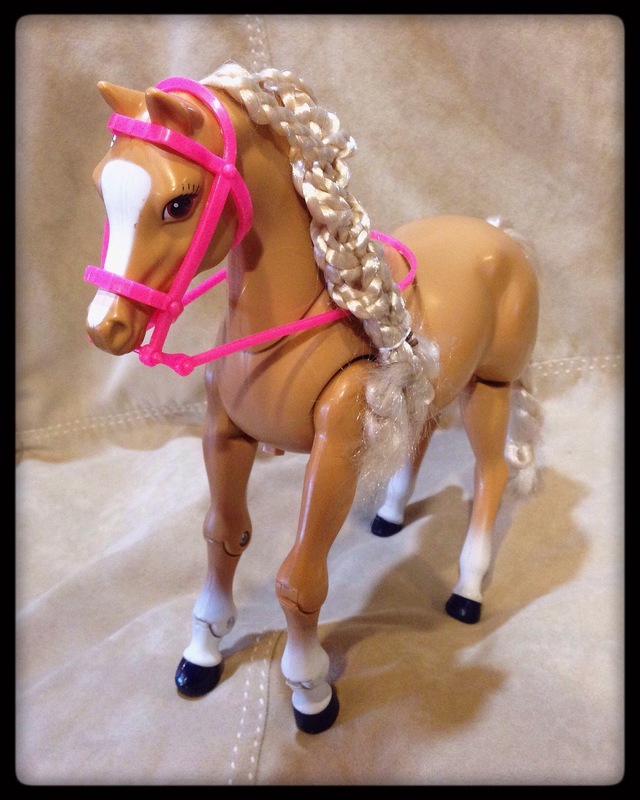 I remember that my horse came with a bridal, a saddle, and some pendants for her hair all in matching pink. I was able to find a similar set, but all of the horse’s accessories were in red. Oh well! You can’t win ’em all. For now, her exact identity will have to be a bit of a mystery. The craziest part about this horse is that I bought another horse exactly like her from a flea market nearly a year ago. 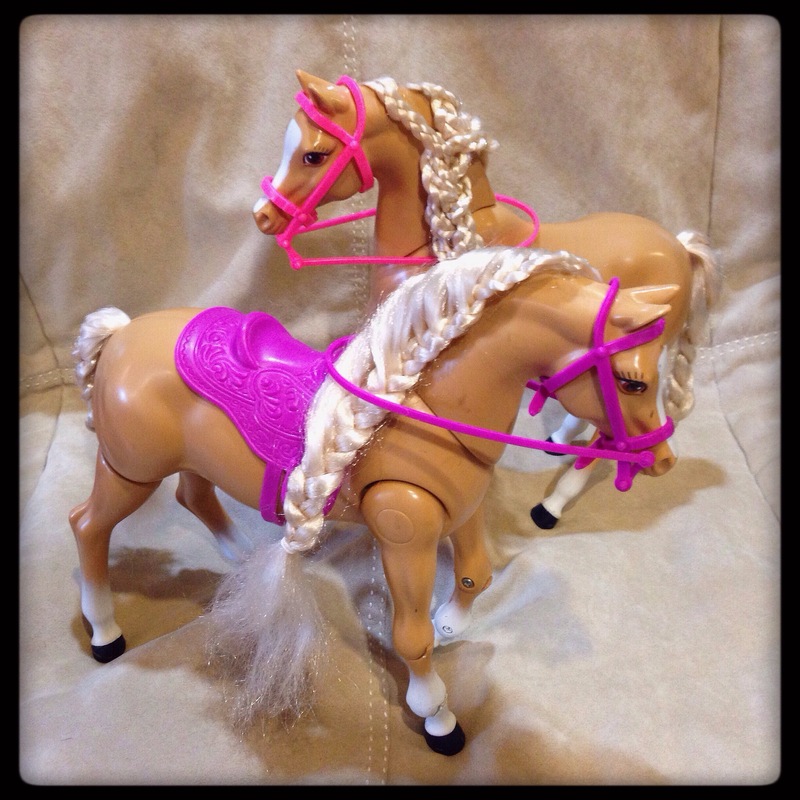 I bought the flea-market horse because it reminded me of the Barbie horse I had as a child. I am just blown away that we were able to find that original horse after all these years. Now that we’re home, I managed to find the second horse and I braided her hair, too. 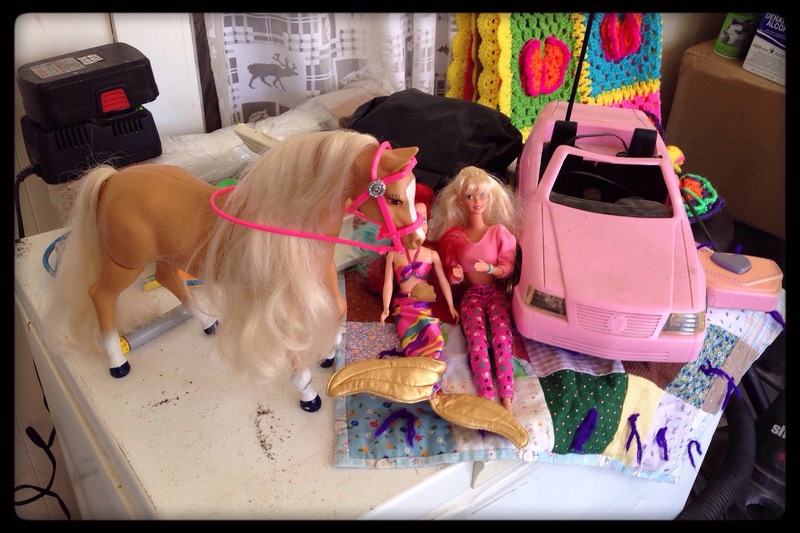 I need 4 more Barbie horses and we can reenact the Kentucky Derby. If I can find them, I will make sure to make outlandish hats and dresses for the dolls in attendance. Anything less would be improper. 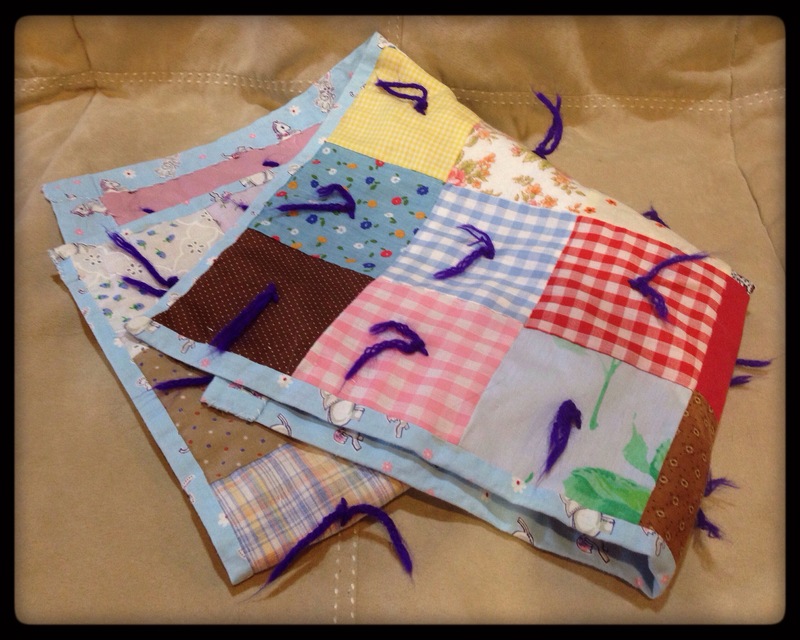 The final item I will share with you today is a doll quilt. This quilt was made for my by my paternal grandmother when I was a little girl. I don’t remember when I received it, but I am fairly sure that all the grandkids got a small quilt for Christmas that year. This quilt is too large for a Barbie doll; it was made to wrap a baby doll into when playing. I adore it! It makes me want to dabble in quilting. I have considered making a pot holder or a Barbie sized blanket. We shall see how my other sewing exploits go before I commit to a big quilting project. I’m not sure if or how I will incorporate these into Barbie Who?, but I thought it was fun to share this unexpected blast from my past. Currently, I am grounded from knitting and crochet because of an injured wrist. I was in a car wreck, and the steering wheel was none too kind to my body. I am trying to spend the down time writing on the blog and doing some sewing. Sewing is more of a chore because of the wrist brace, but I am confident I can adapt. Depending on my ambition, the next update will probably be a sewn garment for the second Ood doll. If not, it will be another tidbit from our summer back home. Until then, cheers! That is awesome! Ariel truly is the coolest Disney Princess.